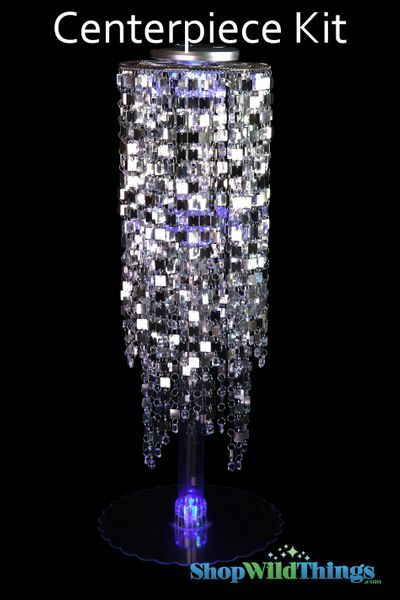 The "Kalina" Silver 6 pc Centerpiece Boost Kit Features our beautiful "Kalina" Silver Chandelier and a clear acrylic riser that is 29" tall. This is a perfect centerpiece idea for any special event! 1) "Kalina" Silver Chandelier : This super fabulous "Kalina" chandelier is made using our Shimmy Lightweight PVC beads MIXED with faceted high-grade acrylic square shaped beads. It's amazingly shiny and shimmery. 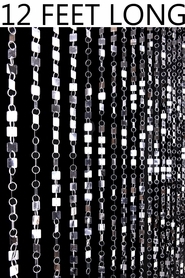 It's 9" in diameter and 23.5" long plus has a 10" hanging chain. There are 2 Tiers of beads for a wonderfully full look.This is a chandelier Decoration and does not include a light kit. So many of our customers just want these to hang anywhere and do not want the electrical cords. If you do want to use an electrical cord kit and light bulb, we sell them separately. SEE THE LIGHT CORDS HERE. We have included the hardware to place in the center that will hold the light kit in place. You might also consider using our LED lighting to insert on top of these. They are very easy. You just slip an LED Disc on top of the fixture and turn it on. The photos show this item with our LED Submersible Lighting as well as one of our LED Light Discs on top, which are sold separately.) Please Note: For our 29" and 39" Boost Kits, we recommend filling up the tube with some weight or gluing the bottom plate to a wide mirror to increase stability. You might also choose to glue the parts together for added stability. You will want to tape the chandelier frame to the top plate so that it does not slip around and also tape the LED Saucer to the top of the Chandelier. 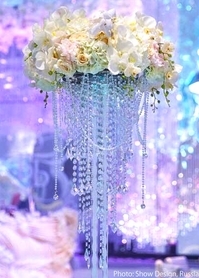 This will allow you to feel comfortable that the tall centerpiece kits will not topple over during your event. For tape, we love using U Glu Dashes (we sell it) because they are super sticky and are hardly visible. It's like that sticky stuff that comes on the back of a new credit card in the mail.